Once I'd got into the swing of Russian reading with War & Peace it was only a short hop into just about every other unspellable Russian novelist on my shelves, but at the same time a glaring gap in my knowledge was exposed. It became apparent that, as a child of the 1950's, Russia only meant spies and the Cold War, I had no real depth of understanding about Russia the country or the people, beyond James Bond. 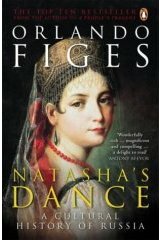 To the rescue Orlando Figes and his measured and fascinating guided walk through Russian history and culture, Natasha's Dance and huge thanks to Daphne who stops by here for the recommendation. Orlando Figes must know all there is to know about Russia but doesn't rub your nose in it with extraneous and irrelevant detailed analysis. I sometimes sense with non-fiction (and with fiction come to that) that I am being treated to a blow by blow account of an authors's arduous and expensive research trip and will be told every last detail whether I want it or not. Mostly I don't and the book starts to wilt around the edges and sink in the middle for me. 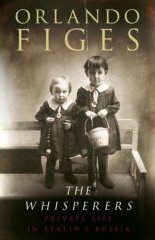 Not so Orlando Figes, so when The Whisperers, Private Life in Stalin's Russia published by Penguin, arrived, despite weighing in as a good sized newborn and being 740 pages long, I was not in the least deterred. Goodness, aren't people grudging and rude? Or is that what LitCrit is? Hip hip hussar for decent companionable style I say, that means it's fine for us lesser mortals, put it on your Christmas list, at least it won't just sit unread on the shelf for the next ten years. The Whisperers draws on hundreds of secret family archives from private homes across Russia, detailing life for millions of Russians under the tyranny of Stalin.Life lived at a whisper because you couldn't be sure who to trust, or life whispered as a treacherous betrayal of friends and family to the powers that be. The dialogue with the self, a safe place to voice inner thoughts, safe as long as no one found it of course. Finally those diaries now see the light of day. The sheer stomach-churning-ness (new word alert) can only be guessed at until you start to read this book and the bleak reality is gradually revealed. Standing by a husband who had been arrested placed an enormous strain on the family, anything, literally anything could and did happen; eviction from homes, dismissed from employment, deprived of rations or wives dispatched to a labour camp minus the children. The whole subject always returns me to the words and life of Anna Akhmatova and her magnificent poem Requiem. The story is well known.Having lost her husband to a firing squad and then enduring the lengthy imprisonment of her son, Anna Akhmatova chose to stay in Russia and bear witness to the horrors and I don't even need a hint of a tint of an excuse to quote from Requiem in my favoured translation by Stanley Kunitz. 'The stars of death stood over us. into the house slips the yellow moon. and balks at a shadow that yellow moon. So much to absorb from The Whisperers I think it'll keep me going for years, or at least until Orlando Figes has written his next one.